Challenger Lifts’ 4015series 15,000 lb. four post automotive lifts are the complete package for expanding your service offering and revenue potential. The 4015series four post lift comes in several productivity configurations including open front general service flat deck auto lifts and closed front general service flat deck auto lifts and alignment rack vehicle lift packages that support today’s latest camera imaging alignment systems. 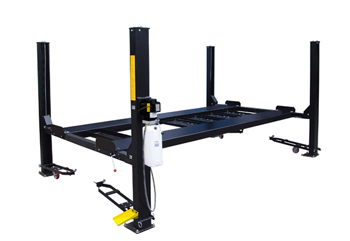 With the 4015series four post automotive lift, shops are able to service small passenger cars and medium-duty trucks, vans and fleet vehicles on one automotive lift. 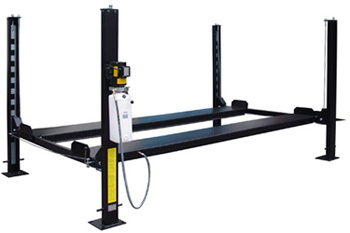 Alignment Rack models (AR4015EAX & AR4015XAX) include a package of two 7,500 lb. 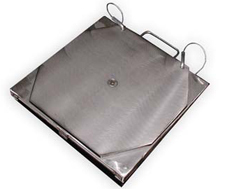 rolling jacks, internal air line system for the dual rolling jacks, flush mount stainless steel turning radius gauges, rear slip plates, multi-position work-steps and automatic wheel stops. Are you looking for a powerful 4 post hydraulic lift? You can find what you need in the 4015 4 post car lift series, which are designed for ultimate productivity. The series features a variety of productivity configurations for optimal working conditions. 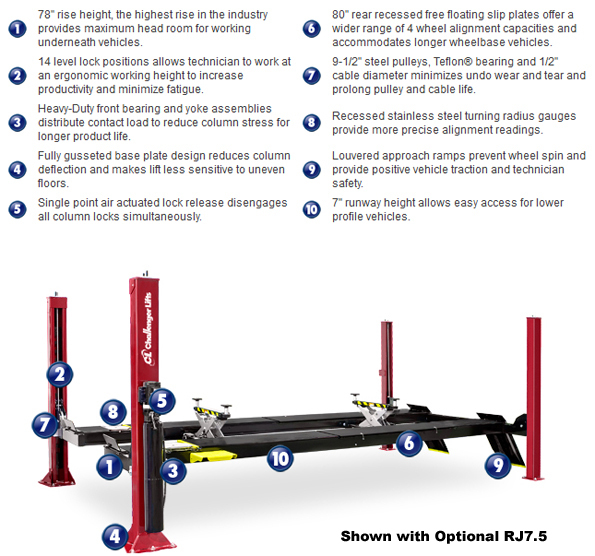 Read the specifications below to find out if this 4 post hydraulic lift is for you. 1. Maximum wheelbase is based on a tire diameter of 30"
2. Optional Three Phase Electrical Power Available. Please Specify at time of order. Standard Color is Red and Blue. Optional Colors Available. 7,500 lb. capacity Rolling Jack for 4015series four post automotive lifts features air/hydraulic operation and includes (4) 3" stack adapters. Broaden your service revenue with easy access to brakes and wheels from underneath four post lifts. 7,500 lb. capacity rolling jacks features adjustable width, low vehicle drive-over clearance, stackable height extensions with built-in storage rack and factory installed and protected filter lubricator and regular. Stainless Steel turning radius gauges for 4P12series, 44018AR and 4015series four post car and truck lifts. Turning radius gauges are used for front wheel alignments to measure how many degrees the front wheels are turned left or right. They are commonly used when measuring caster, camber and toe-out on turns for alignment capable automotive lifts. General service four post automotive lifts can be turned into alignment capable four post lifts with a bolt on alignment kit (Part #40200-3DSS) which includes stainless steel turning radius gauges.